Living a Fit and Full Life: Boost the Anti-Aging Effectiveness of Your Daily Skincare Routine with the New Exuviance AF Vitamin C20 Serum Capsules! Boost the Anti-Aging Effectiveness of Your Daily Skincare Routine with the New Exuviance AF Vitamin C20 Serum Capsules! Boost the anti-aging effectiveness of your daily skincare routine and experience the proven benefits of maximum strength 20% Vitamin C, a gold standard in dermatology. Simply layer the capsule’s potent serum on clean skin before other steps in your routine, or mix it into your daily Exuviance moisturizer. Vitamin C (L-Ascorbic Acid) is an essential co-factor in collagen synthesis,known for its power to strengthen skin’s matrix, improve skin firmness and smooth wrinkles, as well as brighten spots for a more even, radiant complexion. A potent antioxidant, Vitamin C helps neutralize oxidative damage from everyday environmental exposure to decelerate signs of aging. For enhanced firming benefits, our proprietary serum includes patented AminoFil® shown to volumize and target collagen. Single-use capsules limit exposure of formulation to destabilizing light, air, and water while ensuring dispensing is easy and convenient. An ideal skin solution for travel. Vitamin C products are often formulated at ineffective or unstable levels, with packaging that exposes the formula to light, air, or water threatens stability and effectiveness. These secure, single-use capsules limit exposure to de-stabilizing light, air, and water, and make dispensing easy and convenient. Boost the anti-aging effectiveness of your daily skincare routine with the new Exuviance AF Vitamin C20 Serum Capsules! I don't know if it's just because it summer or what, but my skin was beginning to look very dull and unhealthy. As soon as I began using the new Exuviance AF Vitamin C20 Serum Capsules my skin seemed to come back to life. Within a few days my skin looked radiant and my fine lines all but vanished. I'm completely blown away at how hydrated and healthy my skin looks in just such a short time. 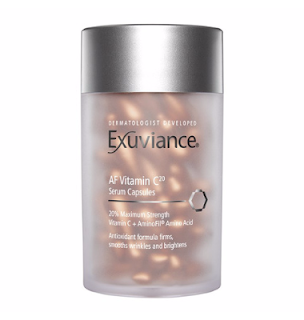 I also love that the new Exuviance AF Vitamin C20 Serum Capsules are single use because this allows each capsule to be protected from light, air, and humidity that threatens the stability and effectiveness. 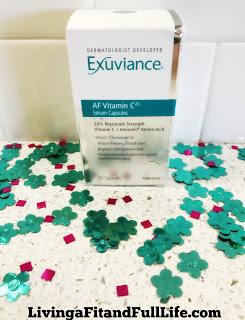 Exuviance AF Vitamin C20 Serum Capsules are just what my skin needed to bounce back to life and will definitely be a staple in my beauty routine!